RCA has a long and storied history with music and the technologies it employs. From gramophones and His Master’s Voice to modern day headphones and stereos, RCA has pumping out systems for years now. 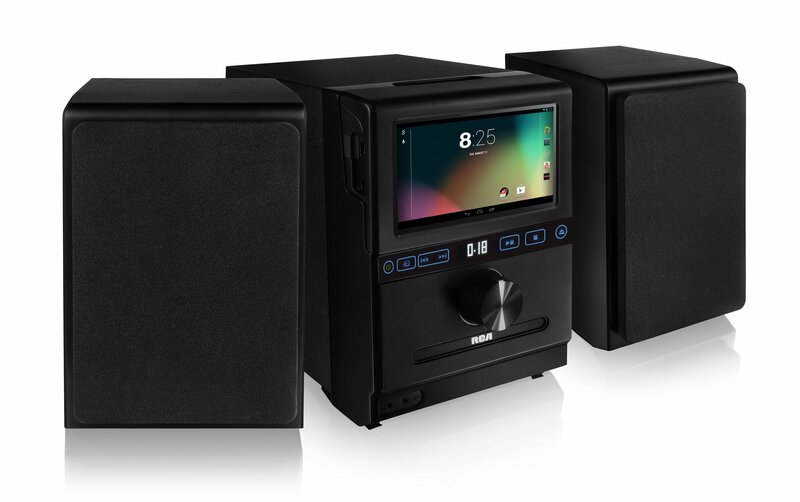 However, one of their latest products, the RCA RCS13101E Internet Music System, is an interesting piece of equipment, most notably because it’s based around a 7-inch tablet running Android 4.1 Jelly Bean. Equipped with ported 2-way speakers, a CD player, FM radio, Bluetooth, a 3.5 mm input jack, and, of course, a 7-inch Android tablet, this is not a stereo of yore. Indeed, the tablet is a fully functioning Android tablet that can be detached from the main stereo unit and carted around, otherwise being used as a typical tablet. The Bluetooth function on the stereo allows you to stream audio from the tablet to the rest of the stereo, which is pretty great. You can check your email, play games, and reconnect it to have it function as the central UI for the system. The tablet itself isn’t an amazing piece of tech, but it performs its functions admirably and quickly, which is really all you could ask. It’s an interesting premise, because not only are you paying for a sound system, but you’re getting a tablet as well, and a fairly capable one at that, which is good, because a lesser tablet would really make the whole experience a bit less fun to use. It would be nice to update the installed version of Android to something more current, and the web is full of hacks to dramatically improve the audio quality, such as installing the ViPER4android FX high quality audio drivers, and installing XBMC 13.1 opens up your SMB network. You do need to Root the tablet to install the Viper drivers, but Jelly Bean is famously tweakable. Bluetooth audio has well-known audio limitations, and it would be have been great if the AptX codec could have been included which provides Bluetooth audio users with dramatically upgraded audio quality, with no extra effort to the users. The only real gripe is that one must download most (if not all) of the music apps, and some of them need a subscription in order to unlock their full potential (looking at you, Spotify). Unless you have an already-loaded Google Play or Google Music account, a lot of the music has to be bought from scratch, because transferring files is really time-consuming and a bit hard to do. So for maximum fun/music, one must pay for more music and more subscriptions. It’s kind of frustrating, especially if you’re not one to pay for subscriptions to streaming services. Thankfully, there are other methods of playing music, like the CD drive and 3.5mm input, but when a system’s main form of playing music require additional investment, it can be a bit of a letdown. As far as sound goes, the system is small but can pack a punch. It stays admirably clear at higher volumes, though a subwoofer would definitely help around volume level 18. At lower decibel levels, there’s a clear response and ringing trebles. It is not an audio enthusiast’s dream, but that’s okay, because it doesn’t need to be. It’s meant for people who want to play music from their dorm room and connect their iPhones. And for a small, affordable system, it’s highly effective. It also looks handsome, with jet-black speakers and a console reminiscent of the original Macintosh. As someone who’s headed to college, I can confirm that this is a mostly small, portable, and easy-to-use system. It fits conveniently on a bookshelf with minimal setup, and there are few wires to worry about. It’s the casual listener’s kind of setup, which, though a bit less fine than other setups, is useful and convenient. Though it may not be the first choice of your resident audiophile, it’s utilitarian and versatile. The RCA Internet Music System is a good pick for anyone looking for a convenient way to stream his or her favorite tunes.